Above: From a higher angle this time! When I decided to make a board game, I had one goal in mind above all else. I wanted to create tension between players' goals and their behavior. I was imagining a scenario in which players absolutely had to cooperate to have any hope of winning, but also had unique win conditions that required them to act selfishly. In other words, this game should require players to cooperate as it helps them achieve their objectives, and then shift allegiances the second it's convenient.What coalesced from that early vague notion turned out to be Honor Among Thieves. The premise: a team of thieves, each with different skills, breaks into a heavily secured mansion to steal a priceless treasure. Players must ransack the mansion, find the keys to the vault, nab the treasure, and escape with their lives. Along the way, they'll have to deal with security guards, cameras, and the occasional booby trap. Fortunately, they can combine their powers to make these tasks easier. Unfortunately, two of them are traitors. Most players are henchmen. To win, they need only to escape the mansion with the treasure. Any henchmen who come with them will also win. They have every incentive to cooperate, except that they know they can't trust everyone else. One player is an undercover agent, in the employ of the mansion's owner. This player's true objective is to prevent the treasure from leaving the house. The easiest and most effective way to get the treasure out of the house is to team up with the other thieves. But you can't trust that the person standing next to you is on your side. And if you're one of the two traitors, you need to keep your identity hidden until the last possible moment. Reveal yourself too soon, and everyone else will gang up to kill you. My hope is that most games end with everybody killing one another in sight of the exit. Every character has a different set of attributes across three categories: speed, cunning, and strength. All challenges in the game are resolved through skill checks against one of those attributes. Players have the option to combine their attributes for a turn -- for example, two players who are trying to lift something heavy can combine their strength attributes and check against the total. In this way, I'm trying to force cooperation, even when two players are convinced that their counterpart is trying to screw them. The question becomes who will blink first. I'd say I'm about halfway to having a finished prototype. The pictures I've been running with these posts come from the first and only pilot test I've run. The board was less than half-finished, and I had about a dozen cards in each category (for example, when trying to unlock a door, you draw a Lock card to resolve, similar to Mansions of Madness). I had four people give the game a shot, guessing that we'd go for about half an hour before finding holes too big to climb out of. To my delight, that wasn't the case. For sure, we were modifying rules on the fly, and addressing significant balance and rule issues from the get-go. 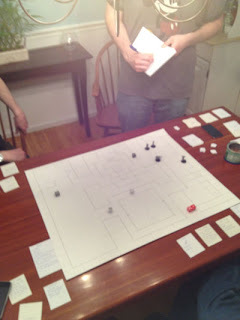 But we spent more than two hours playing out the entire scenario as envisioned. The core idea seemed to work. The thieves picked locks, pillaged rooms, fought off security guards, and canceled alarms. They infiltrated the vault and snuck away with the treasure, almost immediately turning on one another. When only two players were left alive, and nearly to the exit, the undercover agent showed his hand and arrested the remaining henchman. I was left with a pile of notes to address, and a sense that the game has real promise. With the information I had from that session, I was able to finish a complete draft of the rulebook, and make several important changes to the characters' skills. Next, I need to write more cards -- a lot more cards -- and settle on a finished board design. (That's the part I fear the most -- I'm no kind of a visual designer.) Then it'll be time for more rigorous testing. After that, who knows? I don't really harbor hopes of publishing it, but it would be nice to have a finalized version that I could share with the world, even in PDF form. Either way, that's all in the future. Right now I still have a lot of work to do. The most important thing I've learned so far is that making a game isn't a mystical endeavor that's open only to a select few. All you need is an idea and the inclination to pursue it. It's a lot of work, but it's worth it! Dogg, I had no idea you were working on a game. I'll playtest it, either at my work game night or if you ever manage to make it back over for another game night over here. Yeah, I think within a couple of weeks it'll be ready for another test. I would definitely want to observe, though. Lemme know if you want to read the rulebook and I'll send it to you. You'd probably have good feedback. This looks awesome so far! I'm really psyched you're doing this. If you ever have a wider playtest, let me know, I'd love to give it a try. I keep starting hobby projects. I have yet to finish a single videogame, and board games are easier and harder - you don't have to sit there fooling around with XML parsers, but you also can't hide behind the XML parser. My kid and I have been playing with the Lego board games - the games themselves are kind of a mess (the rules are usually terrible), but it's obviously really easy to try new rules and change around the board. We took the Heroica dungeon crawl sets and made a kind of cool board game out of it, where you have to run around a big castle and perform missions. But it's still "missing something," and for me at least that's the hard part - how to make a fun mechanic instead of a ... mechanic. Thanks Chris. I feel like I'm closing in on a point where I wouldn't know what else to do without testing, so at that point I might try to get it out into places. I even wonder if I could put together a PDF with all the rules and gamepieces so people could give it a try without needing to do much work. I know what you mean about the last part. Just by virtue of having made it myself, I feel like there's no way I can fairly judge whether things are working as well as I'd like them to be. Some things are obvious, but some are harder to pin down. That's why you need to get them in front of people, I guess. Have you thought about maybe making this a co-op video game? I'm sure I don't have the chops for that. I'll license it out! Ill try the newest online gaming in the internet and its very cool !